The bar has always been a very special place. A place for great moments and exuberance. We bring back the opulence, style and feeling of the Roaring Twenties combined with the zeitgeist of today. 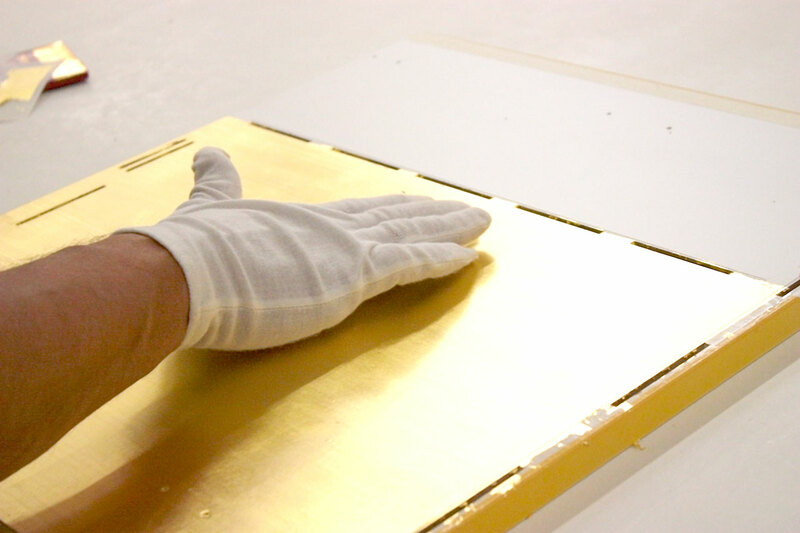 With the best materials and the finest workmanship. For the Hemingway part of the evening, when the elegant sideboard opens to reveal its scandalous double life: an integrated bar of baroque splendour, the playful refinement of which immediately lends any room the flair of an exclusive establishment. When it is time for a new atmosphere and a new culture of conversation. 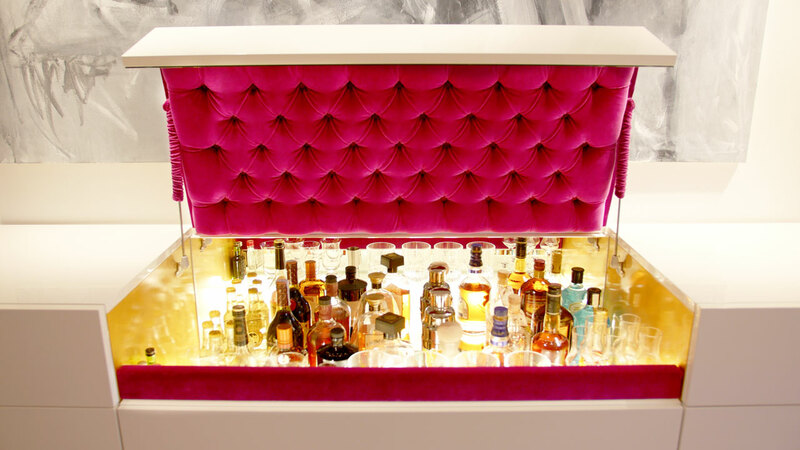 A brilliant piece of bar furniture—innovative, surprising and thought through down to the last detail. The biszet b20 sideboard—an elegant piece of furniture for the most sophisticated tastes. Clear shapes, refined piano lacquer, even symmetry and geometric precision. 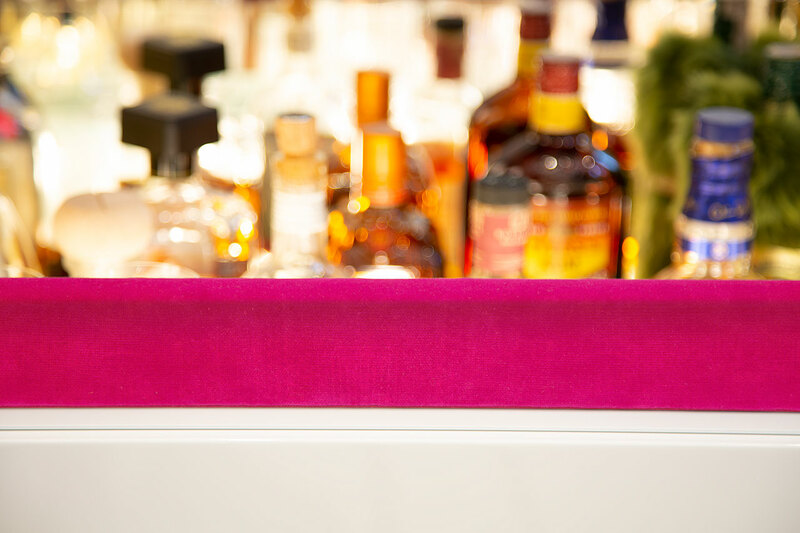 The lid of the integrated bar is silently raised to reveal the fascination of a whole new bar culture. Who can help but think of the famous bars where stars and artists have inspired each other, where you meet connoisseurs and go-getters, bohemians and musicians—the famous places of dramatic presentation, or of solitary reflection on the meaning of the world. The bar has always been the place to meet beautiful women and interesting characters. A place where the bartender understands his guests and awakens their enjoyment with a perfectly suited cocktail. 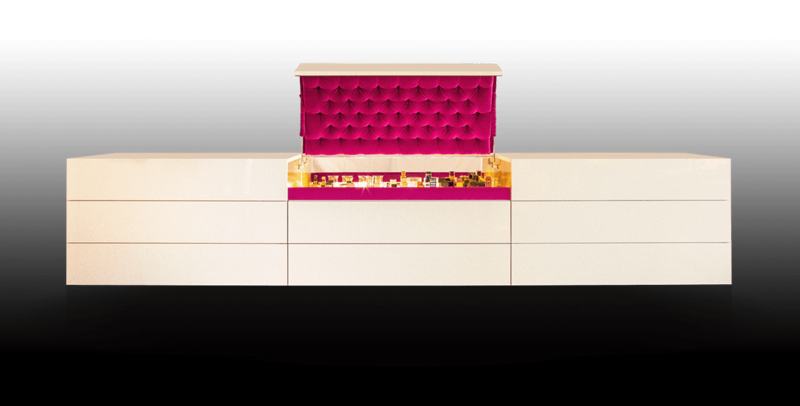 The open sideboard exudes classic bar charm with beguiling colours. 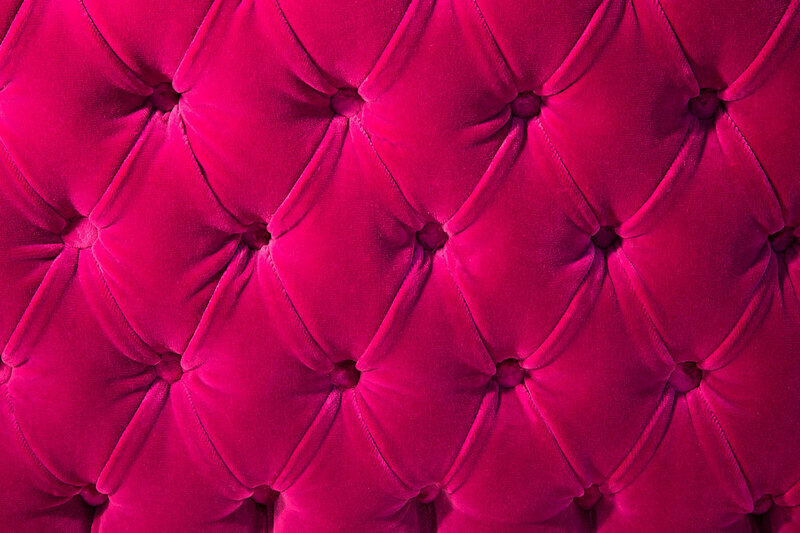 A seductive mix of the finest velvet and the dignified shimmering gold of the side walls. Perplexing placement of light reflections and cleverly positioned mirrors multiply the variety of bottles and glasses, thus making the arrangement a unique live performance. 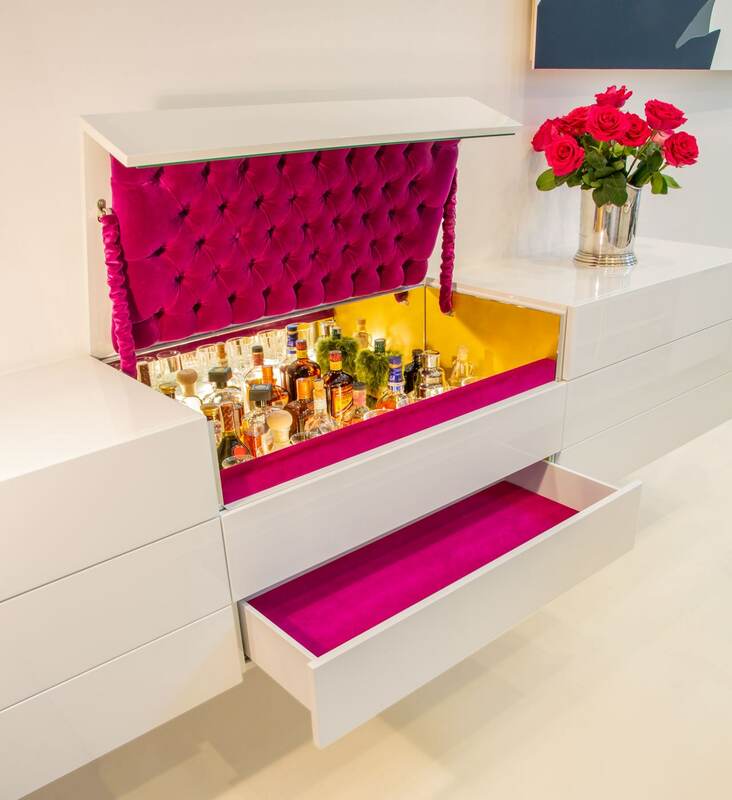 The biszet b20 sideboard—an exclusive bar Made in Germany. The biszet b20 sideboard is a combination of three individual elements with enormous spatial capacity. It consists of three individual modules (A, B and C), each of which is one meter in width and available separately. The centre module (B) contains the bar and, beneath this, a flat drawer. The two outer side modules on the right and left (A and C) each contain an upper flat drawer and a deep drawer underneath. 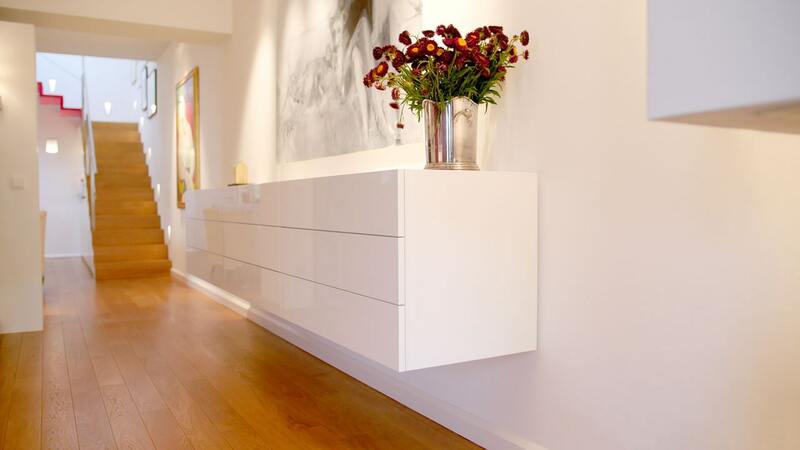 The biszet b20 sideboard is an elaborate piece of designer furniture manufactured in Germany. Combining the elegant purist appearance with the dramatic luxurious intimacy of the open bar requires the use of several almost forgotten skills of traditional craftsmanship. For example, the luxurious piano lacquer look, with its even mirror finish and the resulting light reflections on the surfaces. 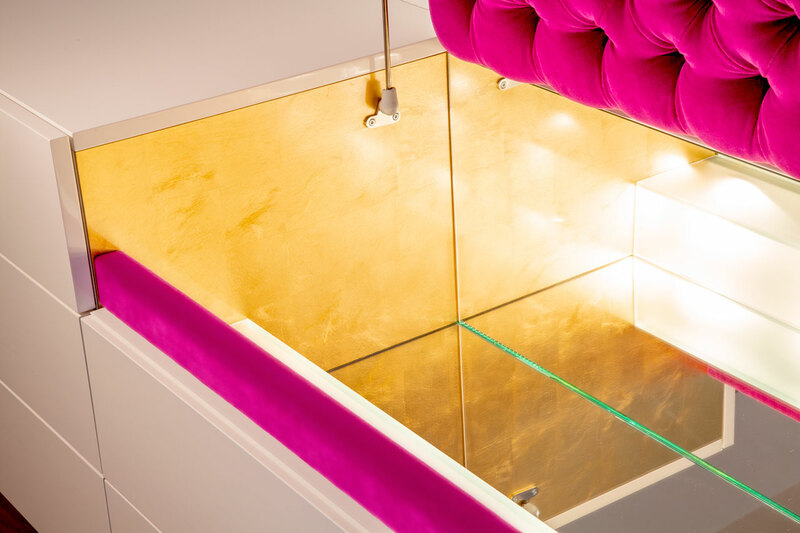 The finishing of both inner sides of the bar with 24 carat gold leaf or the cushioning with fine velvet inside the bar, supplied by Designers Guild, who have been honoured for the high quality of their materials and designs with countless awards. All these craftspeople love to be involved in the production of such an extraordinary piece of furniture artwork. 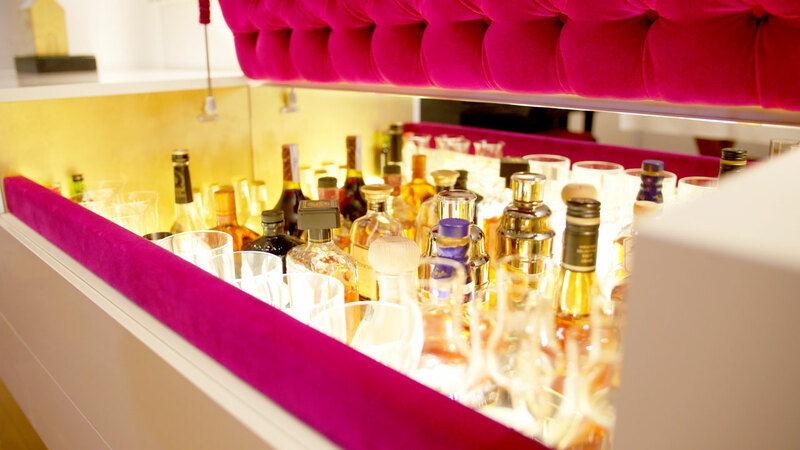 Would you like to take a look at the bar cabinet in advance with no obligation to buy? If so, stop by the Ohhh de Cologne concept store. Not for the mainstream—Ohhh de Cologne is the concept store in the heart of Cologne's Belgian quarter with inspiring lifestyle, beauty, fashion and interior products.